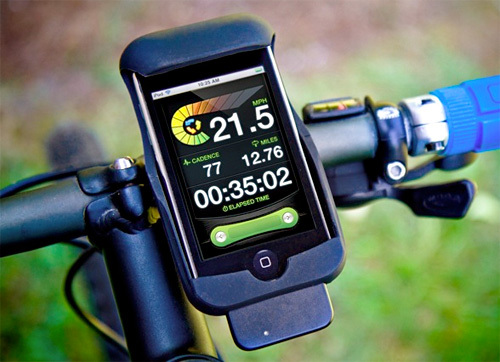 LiveRider Bike Computer – Just Add An iPhone Or iPod Touch | OhGizmo! The last time we brought you an ‘innovation’ from New Potato Technologies it was an iPhone ‘appcessory’ known as the Jackpot Dock which basically turned your phone into a one-armed bandit slot machine. This time around they’ve got something a bit more useful, particularly for pedal pushers. The LiveRider bike computer is a combination of a dual-mode sealed sensor that mounts near the bike’s rear tire and measures wheel speed and pedal cadence, and an “aerodynamic shock-absorbing handlebar mounted cradle” with a 2.4 GHz wireless receiver. Data from the sensor is sent to the receiver which is then fed to an iPhone (3G or 3GS) or an iPod Touch via the dock connector, and used to calculate and display various stats including elapsed time, distance traveled, cadence speed, watts, pace, calories burned, average and max speeds and even ghost data so you can race yourself from a previous ride. It can even access GPS data from an iPhone, and inclination info using the tilt sensor. And if you’re a real number cruncher, all of your ride data can be emailed and imported into a spreadsheet or database application. The LiveRider app is of course free to download from the App Store, but the hardware that makes it usable will set you back $99. And it's not weather-proofed. One light shower and there goes your iPhone. Genius. Sheer genius.